So today I drove an electric car. The last time I had gone to Paris in September, I had only heard rumours about it. Apparently they were testing a small number around the capital and only a select few got to drive them. Then in December I returned to the city, and after a bit of online searching found out that they were being rolled out at a rate of 250 a month. I quickly jumped on the website and subscribed. Seemed pretty cheap as well, 10€ for a day flat fee (with the possibility of having a monthly rate of around 30€), with an additional charge of 7€ per half hour. The electric car of course! And this is no ordinary electric car. Whereas the Tesla Roadster boasts being the fastest electric car around, the Bolloré BlueCar can boast to be the most widely available electric car around as it is being used in the Parisian Autolib’ system. 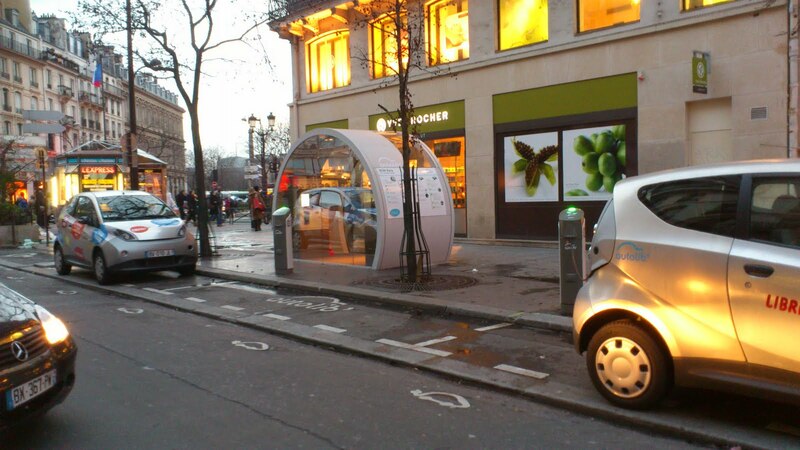 In the same way as the now famous Velib’, where one can rent out a bike at designated stations, in theory here, once subscribed (the process involves taking photocopies of your ID card and driving license, yes, you do need a license to drive the car), you can just walk up to a station and pick your car up. The system being at its beginning, the experience is not as perfect as we are told. First of all you have to find a car! I started my search at around 3.15pm, after a meeting. I went down Rue du Louvres, as I knew there was a station around there. 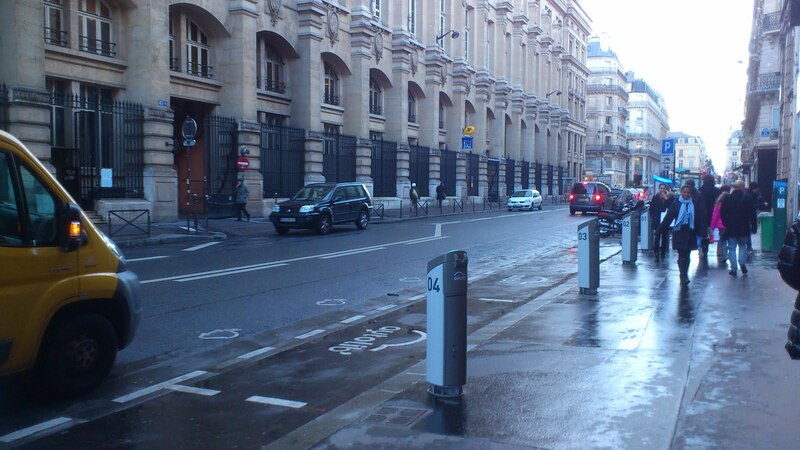 There was, but with the exception of some renegade Parisian drivers parking their cars in the spots, the places were empty. I then proceeded to walk to Chatelet, as I remembered there was a station around that area. Turns out Chatelet is quite a big place, and after an hour of turning in circles I came to the conclusion that the station was just a myth. Still, maybe I needed to research the location a bit more. I then had an excellent coffee at McDonalds (McCafé, seriously try it, better than Starbucks), and courtesy of some wireless internet, found out the exact spot of where the station was. (yes, I should have done that in the first place, but where is the excitement in that, and I would have never had that superb Tartelette au chocolat et noisettes). After a little walk (and finding another empty station along the way), I saw that igloo-like house with, and that is rare, two BlueCars! Things looked promising. I proceeded to subscribe, with the help of a technician who was there to assist people. Once the process was done (it takes about 10 minutes), I was assigned car number 2. Oh how happy I was! I then decided to give up and went to meet up with my friends. After having had many laughs and catching up, I checked my phone, and by some miracle, there was a car a few meters away. I ran out towards the location, and there it was. The previous user had even left the lights on, maybe to guide me towards the car, or more likely he had forgotten to switch them of! I unlocked it, unplugged it and clambered in. This time it worked, and the on-board screen took me through the steps on how to use the car. Yes, there is no shifting, yes it is silent, bla bla bla. 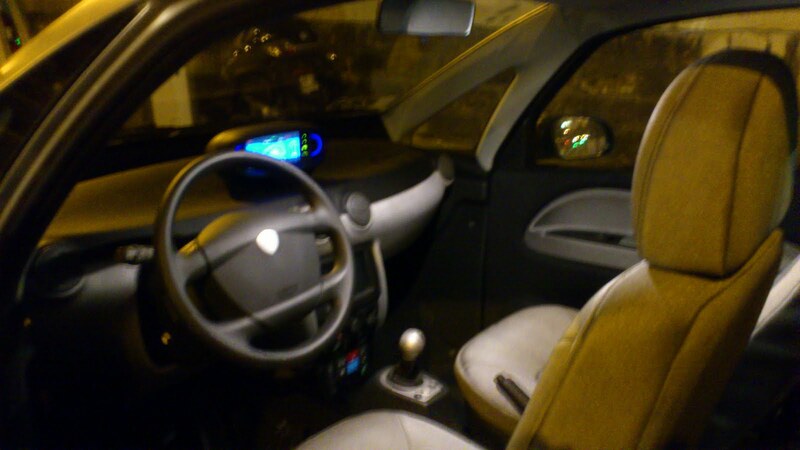 I turned the key (some 3 hours after I began my search), and …..yes nothing happened, its an electric car, silly. Built by the Bolloré group (who incidentally have no experience at all in making cars), and designed by Pininfarina, the BlueCar is being championed as the future of transport. It is meant for urban conditions and multiple users. Therefore, the materials are all very rugged, and there is no paint. Some people complained the car was basic, that it had no ABS or air conditioning. This car is meant for short distances and is built to a very tight budget! Honestly, you will not go over 50 miles per hour in it, and to be frank, the interior felt better put together and more comfortable than a Renault Twingo. It is no Bentley, but it is not what you could call Spartan either. Everything you would need is there, nothing more. That would describe the car, just what you need, no frivolities. In a busy city, who has time for entertainment and gadgets anyway? Over my short drive, the car felt perfect for the city. It feels tough as you are pretty high up, yet nimble enough to overtake that damned scooter. The acceleration is instant, press the pedal and it just whooshes forward with momentum, until you hit 30 mph when the car gets less enthusiastic about accelerating. I say whoosh because that is the sound the car makes. No it is not completely silent when you drive; it makes the same sound as a golf cart. But to be honest, my mum’s Hyundai i10 is very silent as well, so no loss or gain there. The biggest surprise is when you let go of the throttle pedal. In a normal car, the engine brake is fairly unnoticeable, but here you feel it, and it does slow the car down, making the brake pedal a rare requirement. All in all, it is a car. Having tried the car, it has changed my perception on electric cars a bit. For a city use, the BlueCar is perfect. It is comfortable enough, robust enough and adequately fast. Using it is as easy as peeling an orange and to be honest, at that moment in that place, I did prefer driving that car to say, a Mercedes C63 AMG. It does require some time to charge, so it is advisable to travel only short distances. I would not for example, attempt to drive to Versailles in it. However, out of the city, the battery powered electric car does seem a bit at a loss. Until hydrogen technology is refined, petrol powered cars will still dominate that area. The main problem is not just range, but also recharging. Eight hours is a very long time! Swappable batteries, such as what Renault plan, seem like a logistical nightmare and I will not even start on the environmental impact of using batteries on a use-change-use-change basis. With regards to the Autolib’ system I have my doubts. For the system to work, the technology has to be 95% perfect. From my experience it is only 35% reliable. For example, when I had finished with my drive, I plugged the car in as instructed, but the rental period did not end. I had to call the customer service to tell them where the car was. To this day, the car is still registered as in use on my account! The system needs to be popular and must be used by a lot of people also. But then if the cars are so popular, they will rarely be at a charging station, so hardly charged, meaning finding a working one will be impossible. After that, the cars will suffer from all the various drivers and urban usage. And leaving people in a car they do not own, to do what they want to do… Have you seen the state of public trains? Now imagine a public transport that is used in a private manner. All that stuff you did in that car, the guy before you did that, and the guy before him. It can get gross. 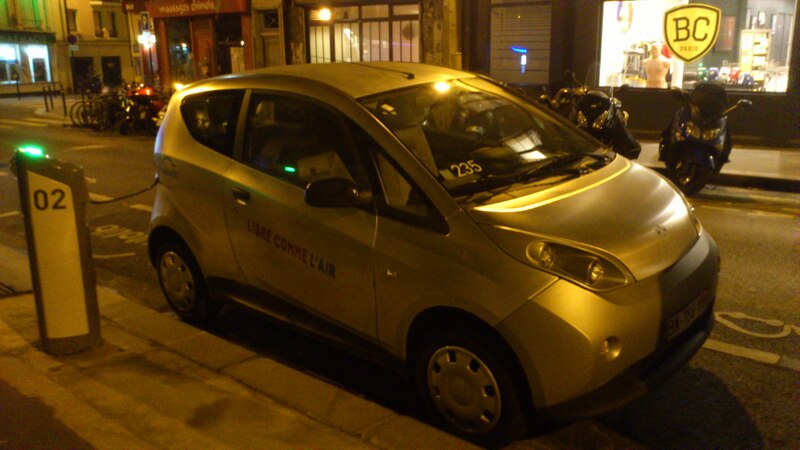 This entry was posted in Car reviews and tagged autolib, bluecar, electric, paris. Bookmark the permalink. 2 Responses to So today I drove an electric car.